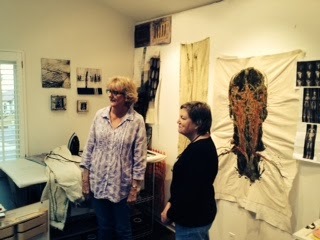 ArtQuilt Gallery-NYC . The Opening Reception is tonight, 6- 7:30. I wish I were attending. Karen's work is so thoughtful elegant. I hope you can get a chance to stop by if you're in the Chelsea area of New York City. If not, check out Karen's website, Karenrips.com and her blog, Fiberartmusings. This month’s talk was about x rays and Madelaine Shellaby, curator of our Art Times Two show felt we would be a good fit. 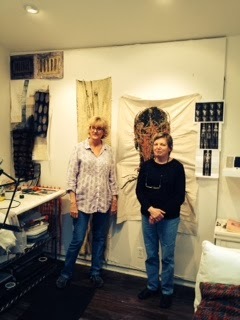 We met in Karen's studio where she and her husband, Ted, had set up her ipad. Karen had placed on her design wall behind us some of our work in progress, which was an MRA of the head and some of the images we used for inspiration. As usual, Karen, the more articulate of us, did a wonderful job while I stood tongue tied. 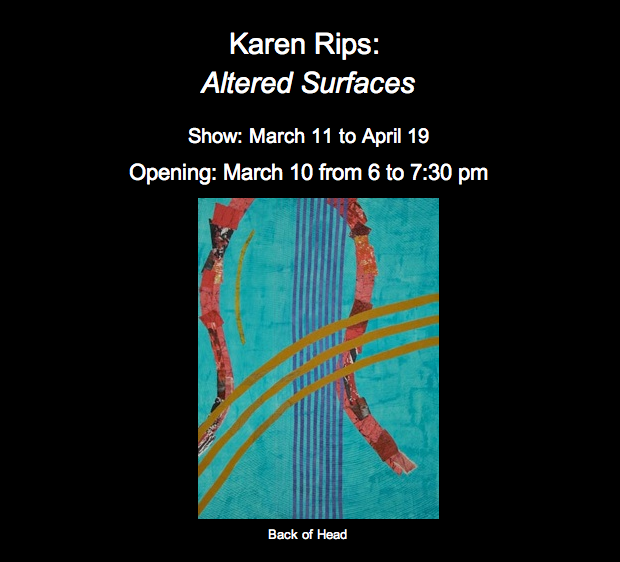 Karen is in New York and will be attending her solo show at ArtQuilt Gallery-NYC tonight.